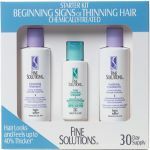 2 Kits - Bain de Terre Fine Solutions Starter Kits Beginning Stages - This kit works quickly to thicken the hair you currently have! This kit is for someone who's hair is starting to thin. This is for chemically treated hair.